For many individuals egg donation is the best opportunity to be successful on a fertility journey fraught with disappointment. It allows the possibility for a male partner to pass along his genetic characteristics and for a baby to be birthed by either the female partner or a gestational carrier. 1. Am I a candidate for donor egg? Many individuals who need to utilize egg donation may be women who have been through oncology treatment, experienced premature menopause, or have reached advanced maternal age. As a woman ages, so do her eggs; women will experience a significant decline in fertility starting around age 35. Decreased ovarian function can occur in younger women and in severe cases complete ovarian failure (menopause) can occur in women under the age of 40. Diminished ovarian reserve also occurs after years of releasing eggs during menses, and can also affect a woman’s fertility potential in her 40s and beyond. Other individuals who select donor egg are gay couples and single men, who utilize a gestational carrier to carry the baby to term. 2. For women over 40, what is the likelihood of having a baby with autologous eggs? The likelihood of getting pregnant with your own eggs over 40 is less than 5% in any given month. If utilizing frozen eggs from an egg donor, a woman is able to achieve a pregnancy closer to 65% during each treatment cycle and a live birth about 50% of the time with one set of 5 to 8 eggs. In a woman’s 20s, at the peak of her fertility, the chances of getting pregnant are only 20% each month, making frozen donor egg treatment a wonderful option to increase a woman’s potential to have a baby later in life. 3. If I receive only one egg lot of donor eggs, what is the likelihood I will have baby? 52% of DEB USA clients will have a baby per egg lot (average of 6.4 eggs). 4. What are the differences between frozen and fresh egg donation? A typical frozen egg donation cycle will take 1-3 months, and a typical fresh egg donation cycle will take 4-12 months. Conventional fresh egg donation costs about $10,000 more per cycle than frozen egg donation. In the past, mostly fresh egg donation was used, meaning the egg donors had to be local to the recipient and their menses would be synchronized with the female who would receive the embryo transfer. In a fresh egg donation cycle, both women need to commit to being available during a 6 week period of time, as the opportune time to transfer the embryo could not be planned. Frozen egg donation has simplified the process allowing the egg donor to cycle at a time that conveniently fits into her schedule. Advanced egg freezing technology has opened up a national database of frozen donor eggs from which to choose. Rather than coordinating travel for the egg donor to fly to your city and synchronize cycles, you can benefit from the convenience of shipping eggs directly to your clinic’s laboratory. 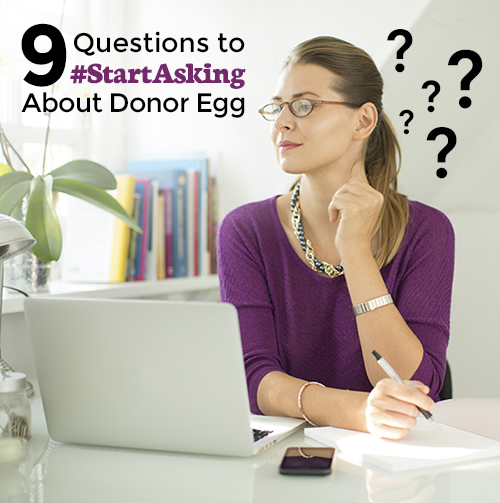 5.	Who is donating their eggs, and what is the application process? Click here to watch a video about one donor’s choice to give the precious gift of eggs and how women between the ages of 21 and 32 can donate their eggs via the DEB USA network. Each year our partnering practices receive thousands of donor applications and are highly selective in who is chosen to be an egg donor. After passing the initial screening, each egg donor undergoes a more intensive medical, genetic and psychological screening process before she is deemed eligible for egg donation. Less than 8% of the applicants will qualify for egg donation as most applicants are screened out early in the process. 6. Should I be worried about the Zika Virus if I use eggs from a donor? In March 2016, the FDA issued recommendations for donor screening to reduce the risk of transmission of Zika Virus by oocytes. Donors are considered ineligible if they have been infected, have traveled to an area with active Zika transmission in the last 6 months, or have been sexually-active within the last 6 months with someone who is infected or has traveled to infected areas. All clinics in the DEB USA network follow these guidelines to ensure the safety of individuals using donor eggs from the database. 7. I have a long history with my doctor, can I stay at my practice and get donor eggs from DEB USA? Frequently, yes; DEB USA is able to ship donor eggs to most programs. Laboratory environments vary significantly in the US and some programs have experience in working with frozen eggs, so not all laboratories are able to receive eggs from DEB USA. The warming process with frozen donor eggs is very precise; DEB USA speaks with each laboratory to ascertain the level of experience in working with frozen eggs and ships to those locations we believe the recipient will have optimal success. 8. Should I be concerned about selecting an egg donor who is a genetic carrier? About 40% of the general population will be a genetic carrier for at least one of the 104 carrier traits we test. If you learn that your egg donor is a carrier of a genetic disease, there is no need to be alarmed. The next step is to be sure that your partner or sperm source is not also a carrier. Two biological carriers of the same disease face a 25% chance of producing a baby with symptoms. If it turns out only the donor is a carrier (and the other biological parent is not a carrier of the same disease), keeping a copy of the genetic report will prove useful down the road. Some day your baby may want to start a family too, and he/she will need that information. 9. Donor egg is expensive -- how can I afford this? It’s difficult to have to pay to have a baby when so many of your friends and family received their dream for free. Nonetheless, with perseverance, nearly everyone who wants a baby finds a way to make it happen. We know it can be hard, so we created the Assured Refund Plan which protects a couple from the financial risk involved with egg donation. The Assured Refund Plan allows up to 6 cycles of treatment with a 100% money back guarantee. It removes the financial risk from the process and a fee is only earned by DEB USA when a live birth occurs. Not everyone has the disposable income necessary to get started in treatment. DEB USA works with CAPEX MD, a company specializing in fertility financing. When financing isn’t the right option, we have seen individuals be creative using Go Fund Me pages, taking out a second mortgage on a home or dipping into their 401ks for a hardship loan. There are also a few national programs offering financial support for couples with low income, such as the Tinina Q. Cade Foundation, Pay it Forward Fertility Foundation, and Kevin J Lederer Life Foundation. By the time you discovered egg donation, you have learned all too well that having a baby isn’t easy. It doesn’t just take a village to raise a child, it can take three, four, or even five people working together to combine the genetic material, the uterine environment, and the desire to make a baby. Thankfully, frozen donor eggs can make the process easier, more convenient and less costly. DEB USA is here to work with you to make a complex process easier to navigate and manage. We are here to cheer you on and help you find baby success. So glad to learn there are potential funding sources for this option. I was incredibly lucky to have parents with the resources to pay for my treatment, and it pains me to think of people in my position without the financial ability to choose this path toward creating a family.